If you are serious about iPad presenting, then you may have already realized that it makes no sense to attach your iPad to a TV or projector with a cable. For one this means that your iPad is physically tied to a location, and you cannot really move around and navigate your content at the same time. And also the fact that you miss out on portability, the iPad’s biggest advantage. The direction you need to explore is quite obvious as far as Apple is concerned — they would like you to look at their Apple TV device. An Apple TV connects to TVs and projectors with the requisite cables. 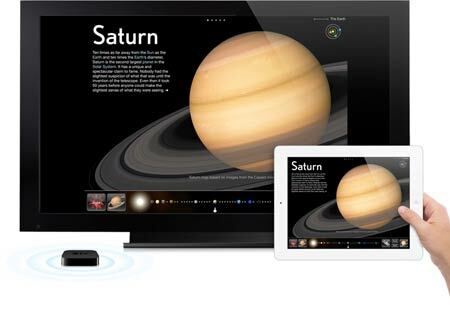 Thereafter it creates a wireless connection with your iPad using the built-in AirPlay technology — the rest of this post will explore both Apple TV and AirPlay. 1) 1st generation Apple TVs that included hard disk space, were larger in size, and cost 3 times as much as the new 2nd generation Apple TVs. These are useless for iPad users since they do not support AirPlay. Also they are too large to be carried around. These included a remote as shown in the picture below. 2) 2nd generation Apple TVs that have no hard disk space (they actually have 8GB of flash disk space, but that is undocumented). 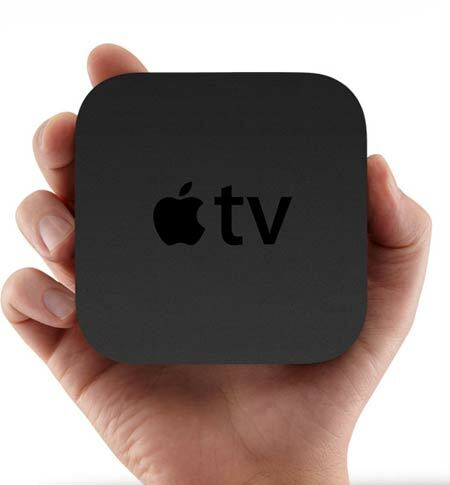 These are much smaller than 1st generation Apple TVs, and are AirPlay capable making them great to use with iPads. They also are small enough to fit within the palm of your hand and can be easily carried around along with your iPad. These also include a remote, although the remote is not shown in the picture below. 1.iOS 5 installed on your iPad, iPhone, or iPod Touch — this update adds improved AirPlay capabilities to your iOS devices. 2.An iPad 2 or iPhone 4S will provide you with AirPlay mirroring — thus anything that shows up on your iOS device screen will show up on the TV or projector output. If you have an iPad 1 or an iPhone 4, AirPlay will still work — but just with the Photos app — and not much else. That’s not as limited as you may believe — you can save most of your slides as successive pictures in an album — you can then have a cool presentation showing off your iPad 1 or iPhone 4. You will lose out on animations and multimedia — but many iPad and iPhone apps still do not support all PowerPoint bells and whistles — so that’s not such a bad solution! On the other hand, what irks me is that even Apple’s own Keynote will not support AirPlay on iPad 1 and iPhone 4. In the next article in this series, we will look more at AirPlay, and what more you can do using this technology. Geetesh Bajaj has been designing and training with PowerPoint for 15 years and is a Microsoft PowerPoint MVP (Most Valuable Professional.) He heads Indezine (www.indezine.com) a presentation design studio and content development organization based in Hyderabad, India. The site attracts more than a million page views each month and has thousands of free PowerPoint templates and other goodies for visitors to download. He also runs another PowerPoint- related site (http://www.ppted.com) that provides designer PowerPoint templates. Geetesh also is the author of the best-selling book Cutting Edge PowerPoint for Dummies and three subsequent books on PowerPoint 2007 for Windows and one on PowerPoint 2008 for Mac.